An Almaty-Atyrau passenger train No.41 has run off track in Atyrau Oblast in western Kazakhstan on Saturday evening, April 19. Kazakhstan Transport Prosecutor’s Office opened a criminal case in relation to the accident, Tengrinews reports citing the press office of the Ministry of Emergency Situations. 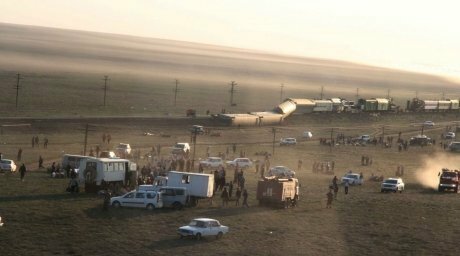 580 tickets were sold the train, but according to the Emergency Situations Department there was a total of 495 people on the train travelling to Atyrau during the accident, both passengers and train staff. 5 people were hospitalized with serious injuries after the accident. No one was killed. “We were sitting and drinking tea when carriages started shaking and ran off track. There were people who broke legs, noses or just got bruised badly. Ambulances arrived to the site and took them away,” one of the passengers Talant Iskaliev said. 12 out of 19 carriages derailed at Sagiz-Makat section of the railway. A total of 44 people were injured in the accident. 21 of the them had to be taken to nearby hospitals. 5 of them were injured gravely. Six of the injured were delivered to Atyrau (the nearest large city) by a medical helicopter. Passengers were delivered from the accident site to the nearest station Makat by buses. Kazakhstan Temir Zholi (KZT), Kazakhstan’s national railway operator, reported that railway traffic was restored at 6:00 a.m. on April 20. The accident caused a hold-up of 10 other passenger trains and 34 cargo trains. “The national railway company made all the necessary efforts to restore the traffic and put all the delayed trains back on schedule. 218 workers, 2 emergency trains, 25 special vehicles like tractors and cranes were involved in liquidating the aftermath of the accident,” KTZ reported. The accident cause is yet to be determined. The Ministry of Transport and Communication representatives arrived to the site of the accident for investigation.